For visitors who like the character and personal charm that a bed and breakfast has to offer, there are a variety of options in the Brandywine Valley. Bed and breakfasts are sprinkled about the Valley and the surrounding area in Wilmington, West Chester, Kennett Square, Glens Mills, Fairville, Chadds Ford, Mendenhall and in between. They run the gamit from country inns, private homes, farms and historic houses dating back to colonial times. Each has its own unique appeal and all are convenient to attractions. We feature some of the best in the area and encourage you to click and enjoy their own brand of hospitality, Brandywine Valley style. 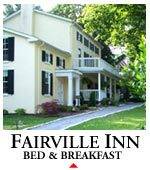 Fairville Inn, located midway between Winterthur and Longwood Gardens, has 15 individually decorated rooms located in three different buildings: the Main House (built in the 1820's), the Carriage House, and the Springhouse. All guest rooms have a private bathroom, satellite TV and telephones. Many rooms have a canopied bed, private deck, and fireplaces, in season. Breakfast and afternoon tea are served daily. "Historic Elegance in the Brandywine Valley"
Built in 1856, this historic English country house is quietly tucked away among flowers and towering trees, gardens, and hiking trails, yet is only minutes away from the Brandywine River Museum, Longwood Gardens, Winterthur and the valley's major attractions. 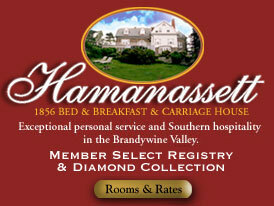 Located on 7 acres, Hamanassett offers romantic accommodations with all the amenities expected by today's travelers. Dog and child friendly carriage house. Recommended by NY Times, Time Out NY, Philadelphia Magazine, Baltimore Magazine, Pennsylvania Magazine, Frommers, Fodors. A Select Registry Property. 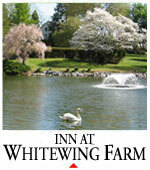 Whitewing Farm is adjacent to Longwood Gardens and actually pre-dates Longwood. The Inn stopped operating as a B&B in 2007, but new owner/innkeepers are once again offering romantic getaways on the 11 acre retreat. 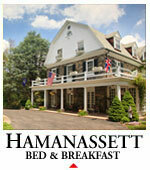 Rooms and suites are in all equipped with TVs, private bathrooms, WiFi and dressed in hunt country elegance. Tennis court, swimming pool with Jacuzzi, pond, putting green. Breakfast is served in the renovated 1796 hay barn.